The mission of HOAInTouch has always been to improve the level and quality of communication in your homeowner association communities. To that end, we are constantly striving to find ways to improve and create a better experience for your residents. As we have previously discussed, our business model has always been to partially subsidize the cost of our subscription plans via advertising. Today that changes somewhat. Based on a combination of customer feedback and an evaluation of the current and future market conditions for local online advertising we have greatly reduced the amount of advertising present on each page. Previously we had three large ad sections, a horizontal section across the top just below the menu tabs, a vertical section to the right below any tiles and a second horizontal section at the footer of the page. We would fill this inventory from a variety of sources including Google and other national ad networks, as well as local advertising and in house ads. As of tonight all three of these sections have been removed. In their place we have added a small, text only Site Sponsors section in the lower right corner of the page (screenshot below). This makes for a much cleaner design with dramatically less “noise” and the site loads much faster. Certainly a better experience for our customers. This change in direction is also a win for our advertisers. Moving forward we will no longer be utilizing Google - or any other ad networks - and will only be displaying our own local advertising. 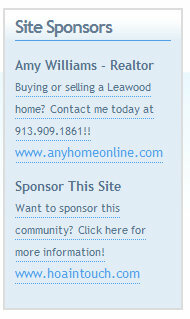 We are also limiting the number of sponsors per community to four and will only be displaying two ads per page. This decrease in inventory and competing advertisers will translate into increased page views and prominence for our local advertisers. HOAInTouch is a tremendous opportunity for local businesses to advertise online and know that they are reaching their target market. If you are a real estate agent, lawn care provider, roofer, plumber, handyman, etc. please contact us so we can get your business in front of local homeowners. For only $25 per month you can reach homeowners in the neighborhood of your choice while they are already thinking about their homes. Thanks and, as always, let us know what you think! We will see you ‘round the neighborhood!